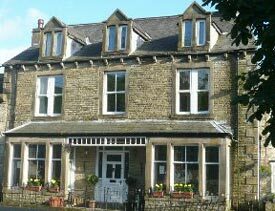 Dale House is situated in the popular Dales village of Kettlewell - the Kettlewell village hall was the location for 'The Calendar Girls' film WI meeting and there are some great tea rooms and a couple of good pubs in the village. Dale House is a good venue for friends and family reunions or group activity breaks. Parties of up to 24 people can self-cater or catering can be provided. Dale House is an ideal base to get away and explore the dales whilst relaxing with family and friends. It has fantastic views up and down the Upper Wharfedale Valley. There are some great Dales walks and cycle routes from the doorstep of Dale House with The Dales Way and Dales Cycle route passing close by. Close by are Grassington, Skipton, Bolton Abbey, Malham with its famous Cove and Tarn and Kilnsey with its fishing, riding and climbing opportunities. Horton in Ribblesdale, the popular Yorkshire 3 Peaks starting point is 40 minutes away. Dale House Kettlewell large cottage accommodation: The ground floor has large hall leading to sitting Room, fully equipped kitchen, dining room, drying Room, ensuite bedroom 1. On the First Floor are ensuite bedrooms 2,3,4,5,6 and 2 separate wc's. On the Second Floor are bedrooms 7 & 8, both twins, bedroom 9 with 5 single beds and 2 bathrooms. The house is centrally heated and all bedrooms have bed linens and towels. Heating and electricity are included in the price. There are 8 parking permits for use in the carpark opposite the house.